COLUMBUS, DAYTON & NEWARK, Ohio – To best meet the end-of-life needs of patients, The Ohio State University Wexner Medical Center is creating a new 12-bed inpatient hospice unit at University Hospital that is scheduled to open fall 2018. The new hospice service will provide end-of-life care to patients from all of our hospitals and will include pain management and symptom control, spiritual support, bereavement support and support groups. Offering the comforts of home, the unit’s 12 patient rooms will feature a nature motif incorporating woodgrain and natural finishes to provide a peaceful environment for patients and families, along with flexible space dedicated to facilitating family gatherings. Staff will include experts in end of life, palliative and bereavement care, such as physicians, nurses and social workers. Families will be able to stay with or visit their loved ones 24 hours a day, seven days a week. 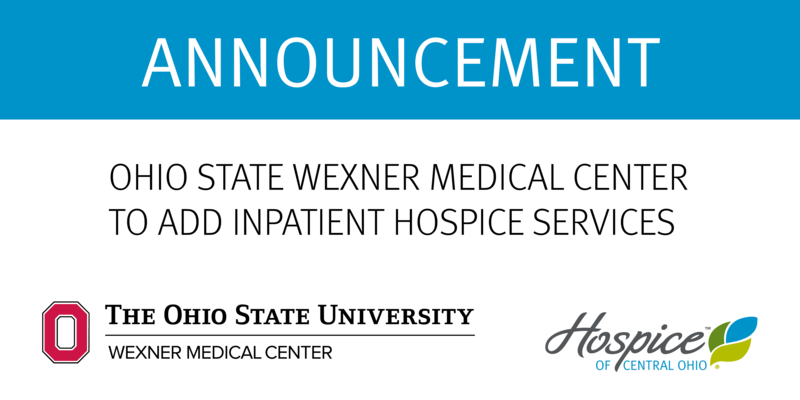 Ohio’s Hospice affiliate Hospice of Central Ohio will manage the inpatient hospice unit at Wexner Medical Center. Ohio’s Hospice is a partnership of mission-driven, not-for-profit hospices in 36 Ohio counties. The addition of hospice services highlights Wexner Medical Center’s commitment to improving healthcare delivery by expanding its continuum of care.